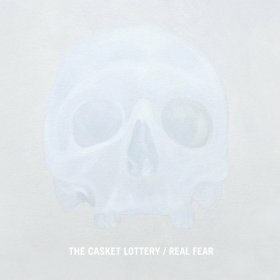 There was no time more appropriate than Halloween time for The Casket Lottery to release their latest full-length. As their first album in nearly a decade, "Real Fear" might have been terrifying to release. But instead of the pressure to show-off a newfound maturity, or to make a major impact and make up for lost time, The Casket Lottery have taken what could have been fear and translated it into a narrative album without the need to interpret it against the backdrop of a “comeback". Much of the fear put into the album comes out in a heaviness heard immediately on 'Blood on the Handle', whose minute-long intro anchors the album down from the start. 'In the Branches' knows that “heavy” doesn’t necessarily mean fast and loud, instead manipulating fear into darker themes of black snakes eating baby birds. A grainy bass, selective screaming into ranges with a Jim Ward sound and a piano which is not quite out of tune but just unrefined enough creates some major discomfort in sound. The band have kept their ‘80’s touch with bass and bell-synth characteristic of the decade on 'The Moon and the Tide' - a sound that creeps again on later tracks. But first, The Casket Lottery take hold of this eerie sound they’ve introduced, using an Addams Family synth staccato throughout 'Poor Dorian' where dual vocals coat each other with differing textures. The band start messing with distortion knobs on 'Ghost Whiskey' in an intro that lasts nearly the entire first half of the song. Using that energy of the tangent, they take the horror film theme to another level with 'Sarastro', which could have easily been used as the score to a Poltergeist sequel. Some tracks on the album are sharply spliced, like 'Baptistina', where vocals and guitar riffs could be ripped apart to form two entirely different songs had they not been joined together, held constant by a bass and drum steamrolling through the entire track. "Real Fear" sees its lowest notes on 'The Door', whose effects sound more like creaking doors and a haunted house than they do synths and switchboards. 'Radiation Bells' is the lightest song on the album but again finds itself with bipolarity between golden vocals raised by darker riffs and guitar flange. Lastly, 'Real Fear' closes the album out with an optimistic solo piano suddenly torn down by the revving of a synchronized electric guitar. Vocals are echoed, screams are suddenly spouted up and in a major pinnacle the band suddenly stops. In theatrical fashion, the last 30 seconds of the track is a few measures of the same, not-quite-detuned piano, placing us in a ghost town parlor. The Casket Lottery take fear and darkness on in ways other than the usual in "Real Fear" – take a look at track names if you need more validation. Whether they were nervous to put this album out or not, the band figured out a way to make an impact which, for those who take to it, has raised them from the dead. "Real Fear" is out November 6th through No Sleep Records.